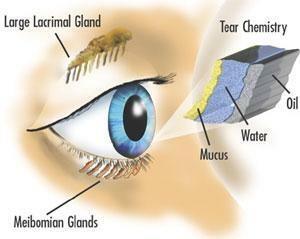 The most common treatment is use of artificial teardrops that help make up for the lack of natural lubricating tears. Artificial tear products come in liquid form, longer lasting gelform and long-lasting ointment form, which is most often recommended for nighttime use. Many different brands of artificial tears are available over-the-counter. Some contain preservatives and some do not. Unpreserved tears may be recommended for people whose eyes are sensitive to preservatives. Artificial tears can generally be used as often as needed, from a few times per day to every few minutes. You should follow the regimen your doctor recommends. If you have questions about which artificial teardrops Primary Eye Care recommends, contact us at 860-243-2020. Contact lenses may be used to treat dry eye. The newest type of contact lens is the largeScleral lens. The lens holds a reservoir of fluid under the lens and does not move much, so the fluid stays in the eye. Primary Eye Care patients have been very happy with this latest advancement in dry treatment.